If you want more maneuvourability while flying a jet then lower the landing gear. This will slow you down and enable you to make quick, shorter turns. It also means that other players in the air trying to destroy will most likely be flying around you (make very large, high speed turns) this enables you get the jump on them. In order to free-aim with the sniper file you need to hold either RT (Xbox 360) or R2 (PS3) half way down and move it from there. This should let you free-aim. When you sign up to Rockstar Social Club you’re given a free shotgun to use in the game. Link your Xbox Live or Playstation Network account and you’ll get a free set of wheels – the Annis Elegy RH8. The Elegy is only given to you when you purchase your first property though. There’s already lots of way to get your car repaired for free in GTA Online but here’s another. Simply go to the GTA Online meny and press “Find New Session.” It’s that easy! This will only work if you haven’t done the first mission for Simeon yet. Basically when you do, you’ll receive a whole bunch of free (cosmetic) upgrades to whatever car you’ve got at that time, and it’s a one-time deal. So before you take the first mission from him, search for a vehicle that you’d like to upgrade and be in it when you start the mission. The only caveat is that, just like when you try to sell vehicles to LS Customs, this won’t work for premium/sports cars like the Obey 9F or for motorbikes. Something like the Karin Sultan would probably get some decent upgrades (or any other car along those lines…). While this car garage is free, you’ll need to be level before you can use it. To get the free garage, simply go to the website for Dynasty on your cell phone and search through it. There will be garages listed there and one of them will be free! To get your car or motorbike repaired for free just go into any mission whatsoever. As long as you get into the lobby then your vehicle will be repaired for you automatically, free of charge. Did you know that there’s gang wars going on in GTA Online and that you can actually watch them fight and partcipate? You just need to be in the right spot at the right time to see everything kick off. What’s more, there’s actually 41 different wars going on and somebody took the time to make a nice little map so that you know exactly where to go at what time! Thanks to ttech10 for the map! Just watch the video below to see how to steal a military fighter jet in GTA Online. Basically you need a fast car and then launch yourself over the fence of the military base using a small hill. We would have love to have produced something like this ourselves, but to be honest the author of this guide cannot be beaten. If you want to do well at the golf game in GTA V then you need to check out this guide it’s an absolute must read! 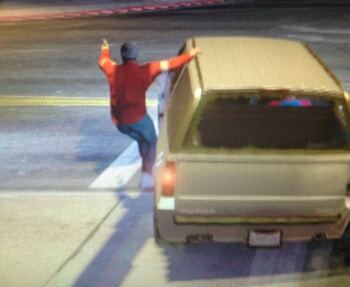 Once you hit level 20 and speak to Ron for the first time in GTA Online then cargo drops will be unlocked for you. Usually they are guarded and you’ll need to fight to get the cargo, but if you first grab a Cargobob (like from the Merryweather people at the Port) then you’ll be able to simply hook the cargo and take it off somewhere else to open up. If you throw a molotov cocktail onto a grassed area then the entire area will eventually catch fire as these pictures show (thanks Darknessfallls). 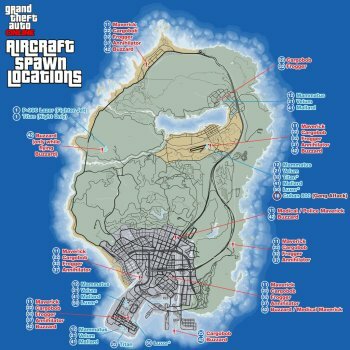 If you want to see where the molotovs are located then check out these maps and guides. In order to hang off the side of vehicles you need to hold LT (Xbox 360) / L2 (PS3) and then double tap Y (Xbox 360) / Triangle (PS3) when you’re next to the door of the car. In terms of positioning you should be in the middle of the front and back doors. If the vehicle has roof racks and side steps by the doors you should be able to do it. For example this will work on the Granger SUV. 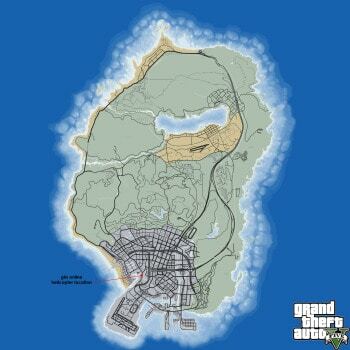 Head to the location indicated on the map below to find where a helicopter is known to spawn. If you want to get the Wanted Level, there is also one at the Airport. To get up hills more quickly just jump-spam. This is much faster than trying to run up them. Yes, this is possible and works just like it does for any other vehicle. 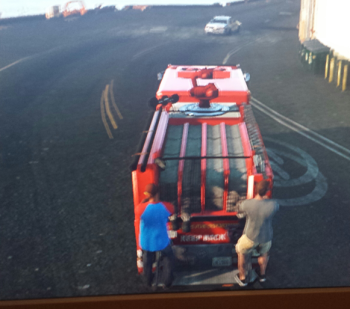 Simply got up to the vehicle (a fire truck in this case) and press Y and you should jump on board! You can stage your very own Hunger Games in Grand Theft Auto Online, all from the comfort of your own apartment! Simply make sure you have a safe house that you can watch TV on and put a bounty on someone. The more money you are willing to put up the more enteraining this is likely to be. Then use your TV to spectate the player that the bounty is on and enjoy! Start an invite only session of GTA Online. Have a custom car that you’ve heavily modified. The Sultan RS is a good one to use and you can resell it for around $72K if modified. Note that you cannot use super/premium cars though. Park your car close to Los Santos Customs (LSC) and then go to pause –> options –> set spawn point. Select a spot close to LSC. Then hold down on the d-pad and select a story mode character. You’ll spawn into single player mode. Once in single player mode hold down on the d-pad again and select your GTA Online character. You should then spawn inside your custom vehicle near the LSC. From here simply drive the vehicle into the LSC and proceed to sell it. As soon as you sell it though (and I mean very quickly) press start –> online –> swap character. This will take you to the GTA Online character selection screen. Simply select the character you are already using (do NOT cancel/back out). You should spawn next to the LSC at your custom spawn point in your custom vehicle! Then simply repeat steps 6-8! In GTA Online it’s possible to resell the same vehicle over and over again to Los Santos Customs (LSC) potentially earning you as much money as you like. We’ve listed the steps to follow below, but you can also watch the video further below. Drive over to Los Santos Customs and spend as much money as you can on upgrades to your bike. Then go to play GTA Online and make sure that it’s an Invite Only session. Head to Los Santos Customs on your bike and when you get there press pause and go to either the Xbox Games Store or the Playstation Store, then exit the store. The first time you follow the pause-store-exit process you should respawn back in LSC without your ride. It will be parked outside around the corner though. Go get your bike and go back to LSC. This time sell your bike to LSC and then do the pause-store-exit process. This time when you respawn you should respawn outside but on the bike you just sold! So now you can start repeating step 6 to resell your bike an infinite number of times. Buy a load of Meteorite and/or Ego Chaser bars before every mission from a convenience store and have your action command (L3 + R3) linked to eat snack. This is a great way to restore health and avoid dying while on missions.